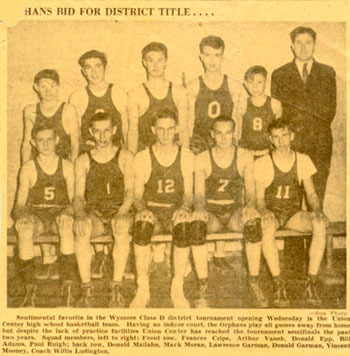 When it was decided we could have a basketball team at Union Center we had no gym, our court was a level strip of ground outside. Poles with hoops were installed and the ground was swept until it was hard and smooth. If it snowed during practice, we just swept off the snow and practiced anyway. 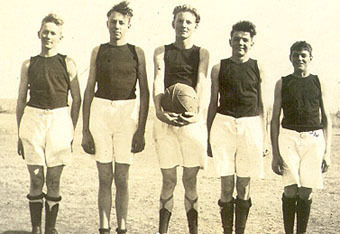 In 1939, the boys were excused from school for five days help raise money to buy basketball uniforms for the team. Corn was shucked for Clyde Mann and Carl Rhine and the boys were paid 2 1/2 to 5 cents per bushel. All the boys in school volunteered to help, since the alternative was to attend school as usual. We had no ceiling to practice under, so most of our shooting had very high arches. We played all the small towns in our area and lost many games due to the fact that the town teams played in buildings with low ceilings. 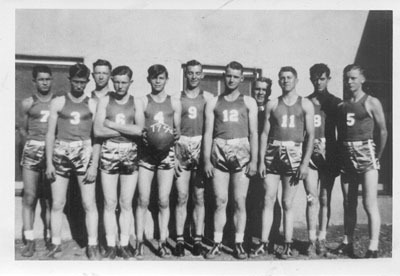 When we played in the District Play Off in Beatrice in 1940, the town had just built a new city auditorium. The ceilings were very high and we played very well and went on to play in the District Championship. We ended up in 2nd Place but we'd had a good season. Baseball was the most popular sport for the school and we always had a good team. One day at practice I was playing third base. The bell for school rang and I started to leave the field just as the batter hit one my way. The boys called to me to stop the ball, I turned around just in time to stop the ball with my jaw and one half of my double tooth! The day before Thanksgiving, I made my first trip to the dentist and had the other half removed. We tried playing football, but after just one practice Raymond Cripe broke his leg and the school board said "no more football." We were playing without pads or helmets with only our coats to protect us.